Loni Fitzgerald didn’t expect to see her cat ever again. The female tabby mix named Clair was only a year old when she disappeared last December. Loni, 30, and her husband, Trevor, searched their Everett neighborhood but couldn’t find their beloved pet. Weeks and months went by without any sign of her. Then came the phone call on Sunday that caught Fitzgerald completely off-guard. An Everett Animal Shelter staff member had found Clair standing in the rain near Pacific Avenue and Grand Avenue. The cat’s microchip, implanted under its skin, helped the shelter locate Fitzgerald, who at the time was packing to return home from a family trip to Hawaii. Fitzgerald, her husband and their 1-year-old daughter, Faith Olivia, were reunited with their cat Monday afternoon at the Everett Animal Shelter. Clair, nestled safely in Fitzgerald’s arms, leaned into her owner’s touch and briefly closed her eyes. Fitzgerald gave her a couple quick kisses. She was undergoing treatment for cervical cancer in 2010 when she adopted the young cat, Fitzgerald said. The two quickly became friends. Her cancer has been in remission for a year, Fitzgerald added. In October, she and her husband decided to get another cat for their daughter to grow up with. They planned to slowly introduce Clair to their new kitten, Boots. He’ll get a microchip in January, Fitzgerald said. 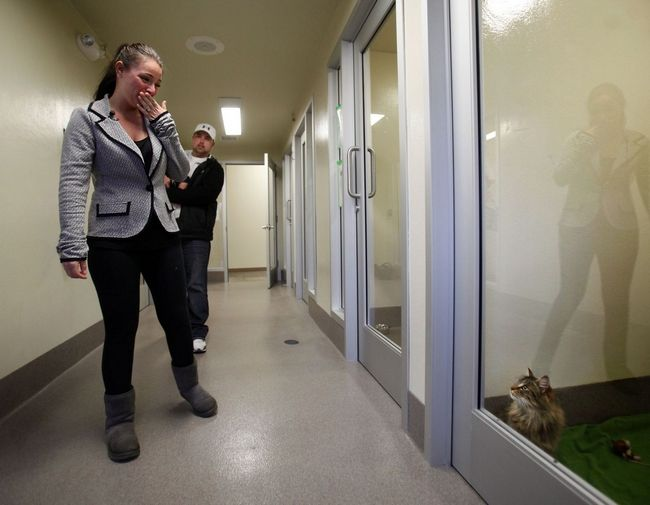 When a stray cat or dog is brought into the Everett Animal Shelter a staff member will scan the animal for a microchip, said Kate Reardon, city spokeswoman. The information on the microchip often helps to locate pet owners. Four of six lost cats with microchips turned in to the Everett Animal Shelter in the past week were reunited with their owners, Reardon added. Fitzgerald said she’s grateful that Clair is healthy after being discovered about seven miles away from her home. This entry was posted on Monday, December 24th, 2012 at 10:16 am	and is filed under Cats, Human-Animal Bond. You can follow any responses to this entry through the RSS 2.0 feed. You can leave a response, or trackback from your own site. I recently got a dog and the girl I got him from says he has a micro chip that was done by the people that had him before her…How do I find out about his micro chip and how to change the address to min,,,,? You have to first take the dog to your vet and they have a microchip reader. They can tell you what brand it is. Then contact the company based on the brand name and go from there. There are several manufacturers.